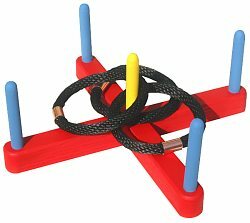 Playing ring toss is very simple. Set the game on the ground wherever you like; you can play indoors or out, and on any surface. Walk about three large steps away from the base and make some sort of deliniation of the throwing area. You can use a piece of string or just a pair of stones. One player stands at the throwing area, and tosses the ring attempting to encircle one of the dowels. Ringing the central dowel is worth three points, and any of the others are worth one. After three tosses, the play shifts to another player. You can play with any number of players or create teams. You can play to a designated goal such as 50 points, and the first player or team to reach that number wins! There are plenty of variations to gameplay. Here are some ideas to get you started: place the base on something other than the ground; set the base at an angle or mount it to a wall, give bonuses for combinations of successful throws (double points for three rings on one dowel, or double points for three rings thrown onto three separate but co-linear dowels). You can also vary the distance that the players have to throw from. To make the game more even between players of different skill levels, set various throwing areas to equalize play. dimensions of base: We were very satisfied with the dimensions that we listed in the plan. Making the base much larger would not improve gameplay significantly and would simply be a larger item to tote around. The base should be massive enough so that the flying rings do not disturb the location. Wind can also become a problem if you make the base too light. size of rings: The smaller the rings, the more difficult it will be to make a successful throws. We recommend that the diameter of the rings be about 1/2 to 2/3 the distance between the dowels. You could make the rings larger and give a bonus whenever a player is able to encircle two or more dowels with one ring. The rope should be thick and heavy to give players some control over the rings; thin rope would be difficult to toss. number of dowels: We chose to make five dowels, but this number can also be altered. A traditional ring toss game has only one dowel; conversely this number can be increased and different scoring layouts can be employed to add more levels of complexity to the game.